Digital UltraViolet and Digital Copy will makes it possible for you to stream the movie Searching HD UV Ultraviolet Code instantly to your computer and compatible Smartphones, Andriod, iphone, iPod Touch, iPad and tablets devices anytime, anywhere. You can also download a Digital UltraViolet Copy or a Digital Copy of the movie Searching HD UV Ultraviolet Code to your computer and compatible devices. 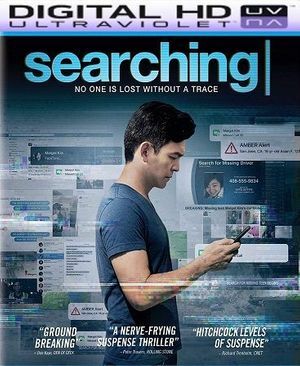 After David Kim's (John Cho) 16-year-old daughter goes missing, a local investigation is opened and a detective is assigned to the case. But 37 hours later and without a single lead, David decides to search the one place no one has looked yet, where all secrets are kept today: his daughter�s laptop. In a hyper-modern thriller told via the technology devices we use every day to communicate, David must trace his daughter�s digital footprints before she disappears forever.